I’m glad I dragged myself out on New Year’s Eve Day to catch Design for a Living World at the Cooper-Hewitt in NY. 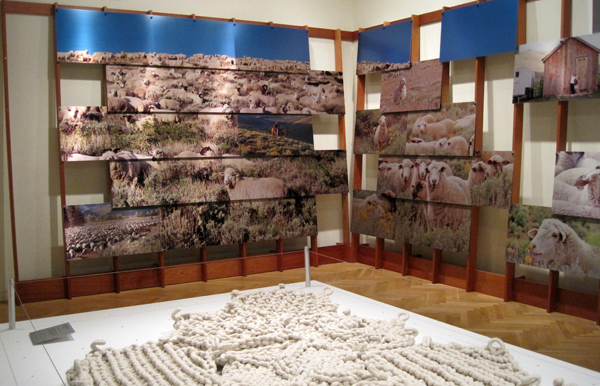 The exhibit’s last day is today, 4 January, so see it now if you’re in the area. Maybe you should ease back into work: take a half day, spend the afternoon in Andrew Carnegie’s mansion. The Monday after New Year’s is hard, I know. While the other exhibit on display, Design USA, was a crowded retread of design work that I’ve seen many times before, by designers whose work I’m already well familiar with—I didn’t leave it feeling any more illuminated or inspired than I did when I walked in—I really enjoyed Design for a Living World. The exhibit organizer, Nature Conservancy, and exhibit co-curators, Abbott Miller and Ellen Lupton, commissioned ten designers to develop new uses for sustainably grown and harvested materials from endangered ecosystems. Abbott Miller also designed the exhibit, with Briant Rant Raby, Jeremy Hoffman, and Kristen Spilman (Pentagram). 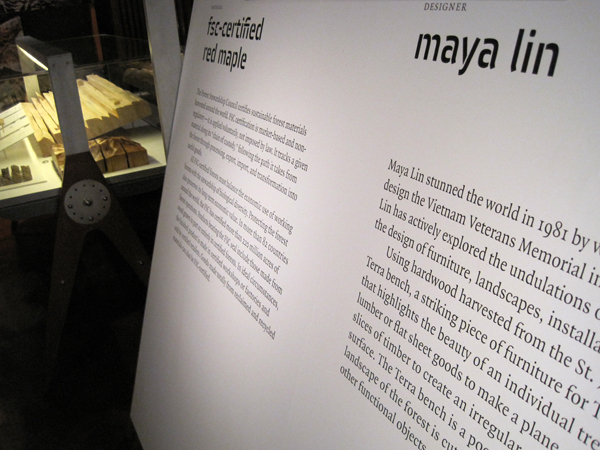 It was tastefully, and thoughtfully, designed, with content that was succinct, organized, and very interesting in its explanation of the materials, the designers, and the ecosystems. On view were the final commissioned pieces from each designer, along with process sketches and experiments. Wrapping the walls of the rooms were image panels, printed by dye-sublimation directly onto aluminum (manufactured with 94% recycled content). These appeared to glow and glitter. I really love the dye-sub printing process. The image panels were mounted to angled wooden scaffolding, made from fsc-certified plywood. 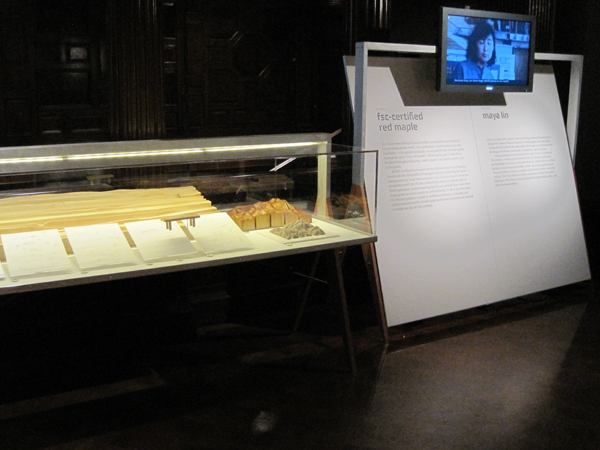 The legs of the display cases were also made from the plywood. Ellen Lupton explains in more detail the green considerations for the design of the exhibit in this post from the Cooper-Hewitt’s blog. One part of the exhibit that I really liked (no photos to show you—docents!) was a long display case in the center of a long room, central within the exhibit space. I happened to come to this at the end of the exhibit, but just as easily I could have seen it first, and it would have worked either way. Printed on the base of the case was an illustration of a black and white world map. Placed on their locations of origin were samples of the materials. It was simple and beautiful, and tied everything together. I loved the images printed on aluminum, too! This was a beautiful exhibition, I’ve been meaning to go back, since it was really crowded the first time I saw it. This was a lovely exhibit, beautifully and simply designed. And I agree, the display case in the center of that long room was fascinating and gorgeous; well-orchestrated. I do think, though, that it’s important to discuss content along with form. While a few of the designers seemed dedicated to understanding the communities and materials in which they worked, several of them seemed uninterested in the overarching goal of environmental preservation and sustainability. This, to me, undermined and diluted the intention of the exhibit, as beautiful as it was. Glad you were able to catch the show before it closed. One note though: I think you meant to credit “Brian Raby” instead of “Briant Rant” as one of the exhibition designers on Abbott’s team. He’s a super talented architect!